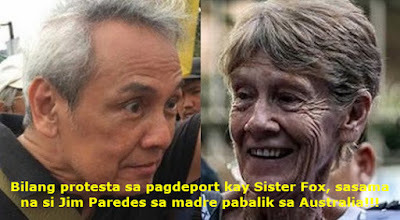 The Bureau of Immigration (BI) on Wednesday, April 25 ordered Australian nun, Sister Patricia Fox to leave the Philippines, within 30 days after she received the official document. The order came two days after the agency forfeited her visa. To protest the deportation order, singer Jim Paredes said that he will accompany Sr. Fox back to Australia. “Sister Patricia Fox was found to have engaged in activities that are not allowed under the terms and conditions of her visa.” The BI said in a statement, noting that the 71-Australian nun was engaged in partisan political activities in the country. However, her legal counsel, Jobert Pahilga, said that they would first file a motion for reconsideration. According to BI commissioner Jaime Morente, Sr. Fox violated Section 9 of the Philippine Immigration Act of 1940, which mandates the BI to determine if a non-immigrant alien shall be allowed to stay in the country or not. He noted that Fox’ missionary visa permits only to engage in missionary work and not in political activities. It can also be recalled that July 2015, then DOJ Secretary Leila de Lima ordered via BI Operations Order no. SBM-2015-025, banning all foreign tourists from taking part in rallies, assemblies or gathering, whether for or against the government. Ironically, the now-jailed LP senator criticized the Duterte administration for deporting Sister Fox. Fox, who has been in the Philippines for 27 years was arrested by immigration agents on April 17 and was detained at the BI office for around 24 hours. Nevertheless, the BI noted that she still return to the country but only after obtaining a tourist visa. As expected, Duterte critics including Jim Paredes disagree with Fox’ deportation. “Funny that DU30 is being intimated by Sister Fox despite her old age. No wonder BI deported her ASAP. As a sign of protest, I will go with her back to Australia and will think a thousand times if I will still come back.” The former member of APO Hiking Society tweeted. He, along with his wife and children migrated to Australia in 2006.